Attention to passengers’ satisfaction and the desire to achieve maximum levels of efficiency and effectiveness in the management of airport processes and in the supply of connected services, has, over time, motivated Gesap to adopt its own Quality Management System. Quality in the field of airport management essentially means supplying services in conformity with the very best international standards, continuous monitoring, the constant improvement of performance levels and periodical assessments of operativity and the results obtained. Gesap, as airport management company, has the following responsibilities: “the coordination of airport operations; the planning and supply of centralised services; the design and management of airport infrastructures; the maintenance of infrastructures, systems and means; the management and delegation of commercial activities to third parties”. 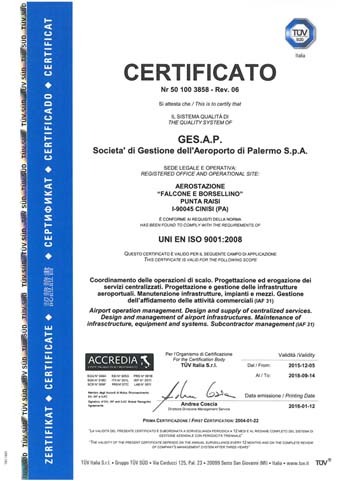 In this operational context, and in conformity with ISO 9001:2008, on December 2015, Gesap’s Quality Management System was renewed – original certification had run since 2002 – as certified by TUV Italia S.r.l. Apart from carrying out its activities in conformity with the managerial and operative procedures contained in its own Quality Manual, and adopting a Quality System for airport management, Gesap also publishes an annual Service Charter and manages a customer complaints service. The former focuses on users’ (airlines, airport operators, passengers, etc.) opinions of service quality levels, both in terms of the quality of services effectively supplied (measured according to set parameters) and in terms of perceived quality of services (surveys). The latter concentrates on an indispensable comparison between the supplier and the service user which, by itself, can bring about problem-solving interventions and the adoption of solutions aimed at satisfying the needs of users. The “environment” variable is a key element in GESAP’s company policy. It occupies a pole position on GES.A.P.’s list of priorities and much time and energy is invested into reconciling it with regulatory obligations and weaving it into a sustainable development plan. From this important standpoint, GESAP has taken a company pledge and has embarked on a comprehensive effort to step up general efficiency and effectiveness without ever neglecting environmental issues; it is keenly aware that protecting the environment is not only a question of legal obligations but is especially an exciting opportunity to boost competitiveness with high standard performance levels thus enhancing its corporate image whilst curbing its impact on the environment. To bear witness to the fact that GES.A.P. sets great store by interacting with its natural surrounds in myriad ways, company staff members have been made aware of the need to strive to protect and safeguard the planet, and in December 2008, after having implemented its environmental management system, GESAP was awarded its environmental certification – confirmed by the Certification Body after its surveillance audit of 29/30 November 2018 and 1 December 2018 – in compliance with ISO standards 14001:2004. 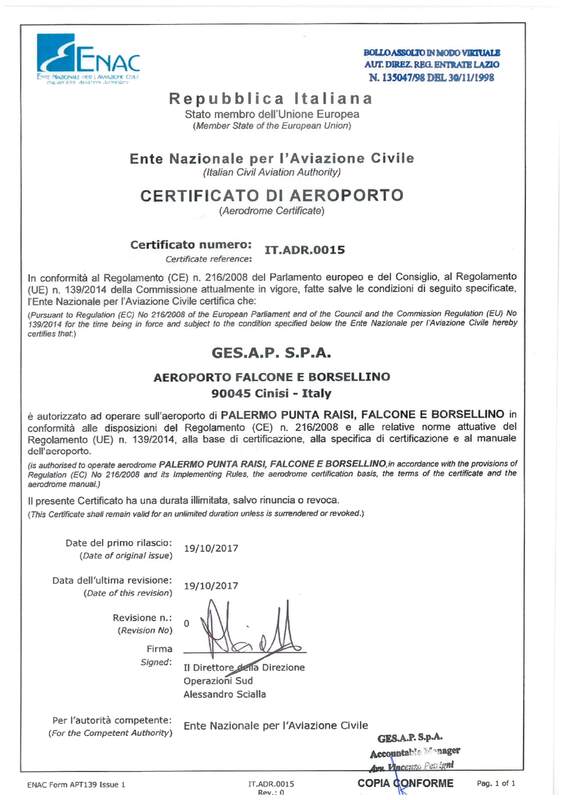 A certificate of conformity which honours the dawn of a new approach marked by a heightened awareness of the environment in general and airport surrounds in particular; a harmonious future takes place as the development plan of this airport in the heart of Sicily becomes increasing compatible with its natural surroundings. As an airport managing authority, GESAP mainly handles the following activities: “Infrastructure management and airport services; allocation, running and supervision of the airport resources; maintenance of equipment, facilities and systems; design and management of the airport infrastructure and terminal; management of the sub-concessionaires and retail activities”. 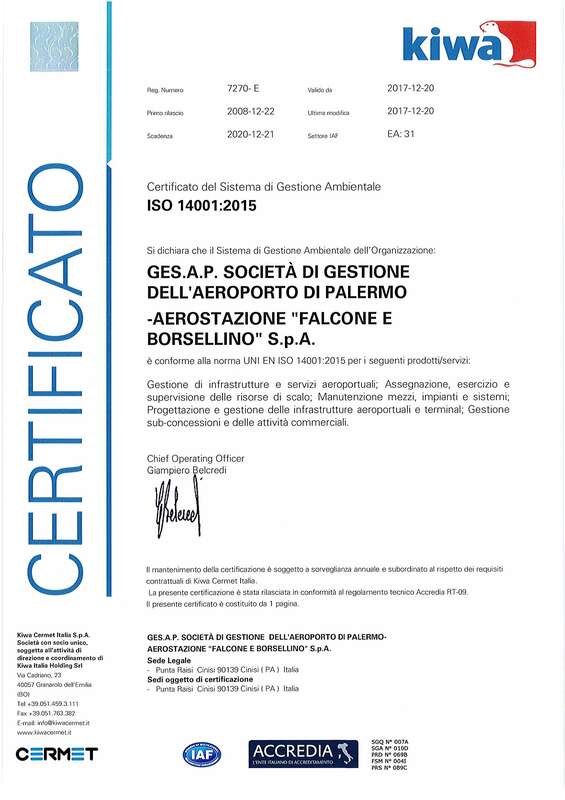 This environmental certification puts the “Falcone-Borsellino airport” of Punta Raisi in Palermo in the running with the most advanced European and international airports in terms of services, operations and infrastructures.